An all-new, unique external analgesic that puts your pain on ice... naturally! Once the body is injured, regular exercise is typically the key to rehabilitation. But when pain limits a body's ability to exercise, the healing process takes longer. Topical analgesics, like Perform help break this pain cycle, by relieving pain through a method known as "Gate Control," In the gating process, menthol acts to stimulate specific sensory receptors in the skin, thereby blocking other receptors from sending pain signals to the brain. By relieving short-term pain, Perform products can help the body to move more freely, which then promotes faster long-term healing and recovery. Cold therapy for pain relief – the favored solution for acute pains and injuries. You already know the most common type of ‘cold therapy’ – it’s ice! 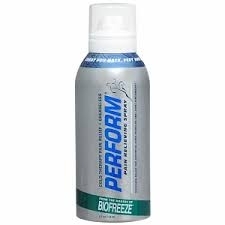 Perform Pain Reliever provides the benefits of cold therapy without the hassles and possible side-effects of ice. Perform Pain Reliever may be used up to four times a day - both before exercise or therapy (to ease pain-free movement), and afterwards (to soothe muscle or joint soreness). In some cases, Perform products may even be used during exercises or therapy.